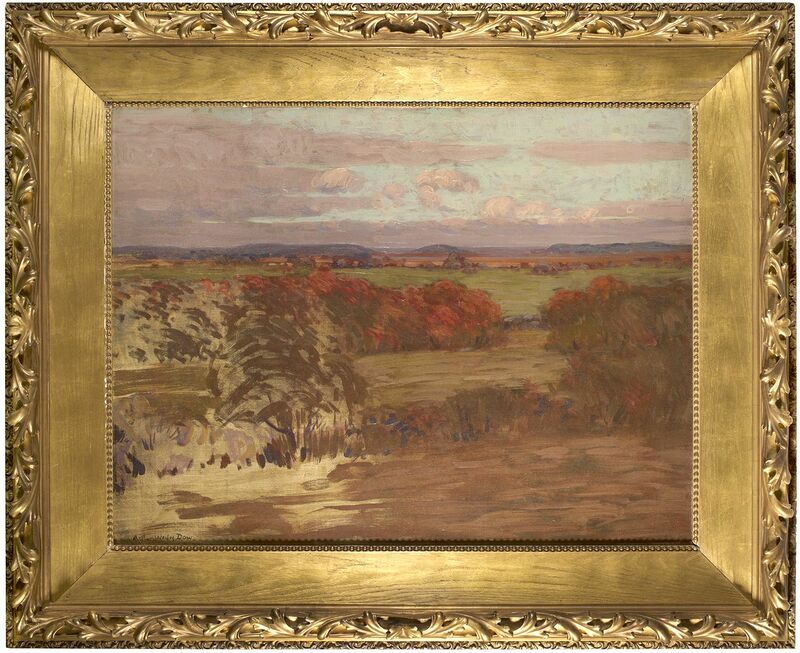 Arthur Wesley Dow - Artists - Gavin Spanierman, ltd.
career, his heart remained in the town that had nurtured him. The feeling, however, was not necessarily mutual. As one Ipswich resident recollected: "Arthur Dow, sensitive and artistic, was always considered to be a bit of an exotic by the natives, and even more so when he became internationally famous. As a youngster he was suspect, and the gossips watched as he sketched and dreamed over the old houses of Ipswich." Fortunately, Dow seemed immune to such comments and in 1889, upon his return from several years of training at the Academie Julian in Paris and at the artists' colony in the area around Pont Aven, Dow thought to replicate his experiences by establishing a similar artists' colony in Ipswich. 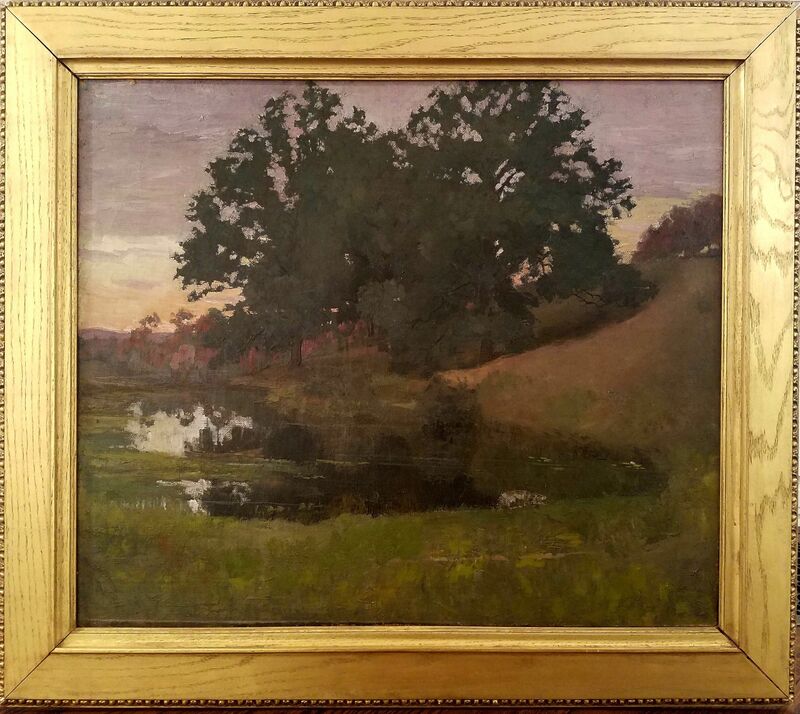 His good friend, the artist, Henry Kenyon, joined him in 1890 but Dow was reluctant to invite others for fear that "his" favorite subjects -- the marshes, dunes, and woodland retreats -- would be stolen. As a result, an artists' colony was never formally established, though over the next several years, for reasons of their own, the painters John W. Mansfield, Francis H. Richardson, and Theodore Wendel all established homes there. Instead, Dow chose Ipswich to be the site of his first school, the Ipswich Summer School, and it was Ipswich itself and the surrounding area that would, for nearly thirty years, dominate his oeuvre. In the early 1900s he built a new studio on Bayberry Hill and throughout his life, even after the school closed in 1907 and his activities were centered more and more in New York, he maintained a residence in Ipswich to which he returned as frequently as was possible. While there, he revisited familiar scenes, sketchbooks or canvas in tow, never tiring of his favorite views. Surprisingly, he seems to have always come back with a refreshed eye and in his sketchbooks he noted detailed observations on the changing colors of the day and the seasons and referred often to this written record when composing his paintings. 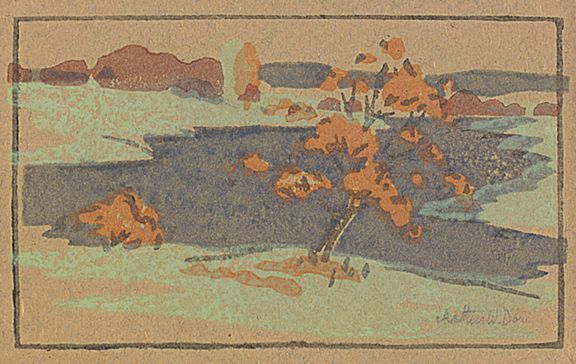 Dow, like the much-admired Whistler, felt that "nature is seldom right" and he exhorted his students to let their imaginations supplement their artistic endeavors. "When doing landscapes, trees, flowers and the like, the student was not encouraged to create a realistic representation of the object but to abstract its line and notan and arrange these elements in a pleasing way." Dow was emphatic on this point and in an 1894 lecture to the Boston Art Students' Association he maintained that "a pictorial composition is not merely an assemblage of objects truthfully represented, it is the expression of an idea, and all the parts must be so related as to form a harmonious whole. It cannot be a work of art unless it has this quality of wholeness. A study must be accurate, a composition must be beautiful. Painting what you see, and as you see it is only studying; it is not creating, it is not composing." By this time, Dow was firmly enmeshed in his theory of synthesis, blending a spiritual eastern sensibility with practical western thought. This concept of the wholeness, the completeness of the composition, takes into account the harmonious melding of line, color, and notan (the blending of tonalities) to achieve a work of art based in nature but not replicating it. The Hillside Pool, with its lovely view onto a meadow pond, is filled with the ephemeral pink/lavender light of late day. The painting can be appreciated aesthetically in all its quiet grandeur but it can also be analyzed for its close adherence to Dow's strict rules for good composition. With its carefully chosen color modulations and implementation of the key secondary elements of opposition, transition, subordination, repetition, and symmetry, the painting epitomizes Dow's ideas in the careful placement of the individual components of trees, sky, pool and its reflection, and hillside, and the balanced interaction of these elements with each other. The overall result is one of great restfulness and serene beauty. A remote spot, the hillside pool is nevertheless welcoming; Dow puts the viewer at ease with his choice of soft, embracingly warm colors, and the depiction of the two central trees, of equal magnitude and grace, as benign caretakers of this little corner of paradise. It is the overall rhythm or vibration of the composition that interests Dow most, the way all the elements flow as one, working as a whole. In this canvas, his love for his native town comes through, strong and true, a song of appreciation for the natural beauties to be found there. 1 Alice Keenan, "The great and famous not so gentle Ipswich putdown," in Ipswich Yesterday (Ipswich, Mass. : Today Newspapers, Inc., n.d.), p. 21. 2 Rosemary T. Smith, "Arthur Wesley Dow and American Modernism," Athanor 5 (Tallahassee, Fla.: Florida State University, 1986), p. 20.